A general view of Ennistymon church. 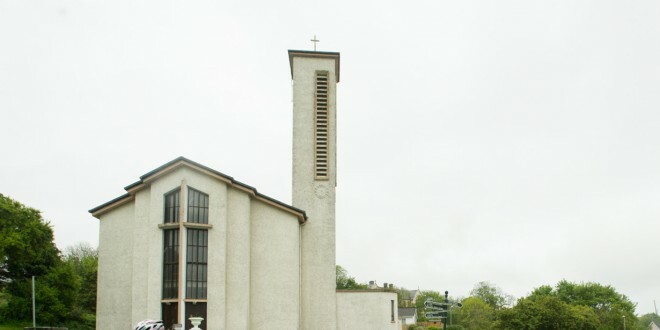 A video, in which a woman claims to have been asked to leave the church in Ennistymon ahead of last Saturday’s First Holy Communion ceremony there, has been posted online. Thousands of people have now viewed the footage in which a woman claims that she is being denied entry to the church because of what she is wearing. She accuses the Parish Priest, Fr Willie Cummins, of making a scene. During the video Fr Cummins does not respond to the woman. She claims she is being discriminated against because she is a Traveller and that the priest allowed “settled women with a lot shorter clothes” to enter the church. A statement from the Parish of Ennistymon, released through the Galway Diocese, of which it is part, stated it has a dress code specifying “reasonably modest attire”. “The community of Ennistymon, which is ethnically diverse and wonderfully cosmopolitan, is fully aware and respectful of this code for it has always had a profound regard for sacred places and for sacred occasions,” it continued. “Every child who received their First Holy Communion in Ennistymon last Saturday did so with great dignity and grace, in an inclusive, prayer and song-filled, joyous liturgy. No child and no parent of a participating child was or would be excluded. These young people are a credit to their parents, their families, their schools, their community and their parish,” it stated. In a second video posted to YouTube, two members of the Gardaí are seen arriving at the church. Speaking afterwards a senior Garda stated that Gardaí were called to the church on Saturday morning but that there was no breach of the peace and no issue.